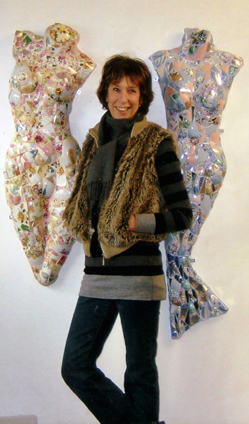 Working with Mosaic and using the female form as a subject, develops from the conceptual clothing side of my work. Shop mannequins are recognised for being stereotypes of an idealised female form. Covering them with mosiac renders them cold and hard, a constrast to the sometimes overtly decorative pattern chosen for the fragments. They become frozen, lifeless. The development of the mosaic work has become a consuming passion for me. I seek out the darkest corners of recycling centres on the outskirts of towns, ferret through stuff at jumble sales and travel to mid Wales for the car boot sale on a Sunday near Machynlleth. Friends leave offerings outside the door to my studio. Of course all charity shops are my biggest source of materials, inspiration and provide a sideways, alternative view of our society with its obscure cultural references. The story starts after I have made the decision to buy an object. Bringing it back to the studio where it is placed next to various other objects. I try matching colours, textures, themes and styles but it is the random combinations that make me laugh that often prove to be the staring pont for a piece. Objects given to me by my Godmother as in 'Tribute to Jean', or the candlestick made from Ingrid's late Mum's ornaments, encourage our associations to have a more tangible outcome. Piecing togther fragements and balalncing the practicalities of the construction with the emotional side of the story is an interesting process. I have learnt about Rocococ, Baroque and Gothic styles of decoration and from an enthusisatic designer friend, about the work of Grinling Gibbons. It seems the possibilities of mosaic are infinite.